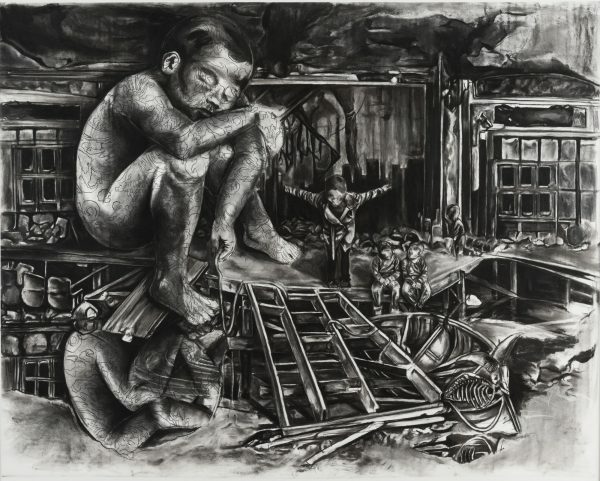 Vidal says of her work “I explore a post-apocalyptic world in ruin; my practice, taking the form of charcoal drawings and sculptures, balances both the will to survive in such circumstances and the vulnerability of the human body. I re-imagine a future world as a place whose inhabitants consist only of feral children and where Mother Nature is claiming back her own territory. Influenced by spiritual experiences from my Catholic upbringing and travels, I am particularly concerned with ideas of religious symbolism, ritual and cult, questioning the reason and primary quest of human beings for faith and transcendence. I use the unique ability of charcoal to capture emotions within a fragile and quivering stroke. The totemic three-dimensional works I create reference to a range of historical, cultural and visual divine objects from around the world, mixing styles from disparate places and period.